Shell size 9 to 48 connectors with 2 to 29 contacts rated up to 220 amps and 5,000 volts. 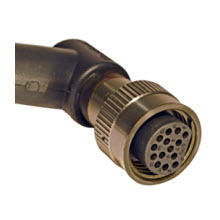 Ethernet cable assemblies are available with TIA/EIA-568-B.2 and IEEE 802.3-2005 compliances. 10,000 PSI rated solutions available with overmolded and pressure-balanced-oil-filled cables.